Located about 20 miles east of the Mediterranean and 15 miles west of Lake Gennesareth, Nazareth is five miles west of Mount Tabor and is the highest point in southern Galilee. Built on the southeastern slope of a ridge at 1,300 feet above sea level, Nazareth has a commanding southern view of the valley of Jezreel. The Hebrew name of Nazareth (natzar: to watch or guard) is said to have come from its defense of Galilee. 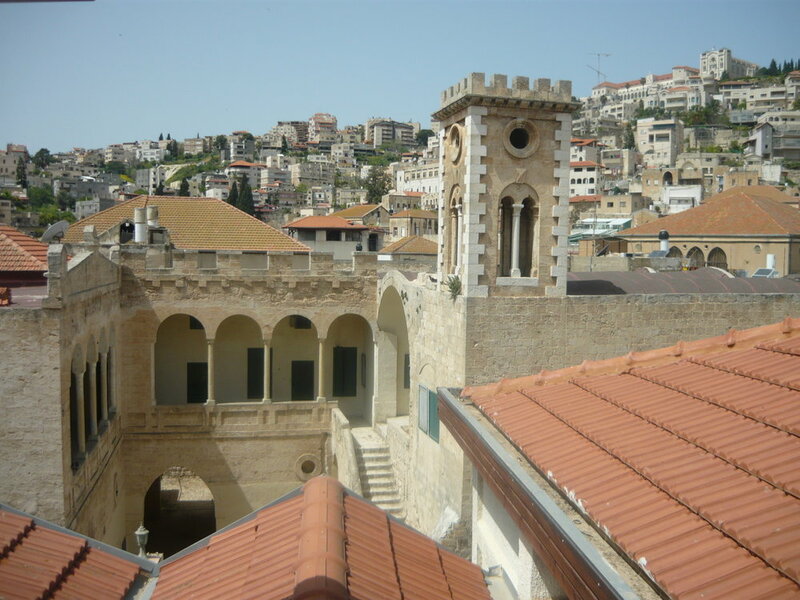 Nazareth was a small and isolated village in the time of Jesus; its population estimated to be less than 200. Today, Nazareth is home to over 60,000 Israeli Arabs. Thousands more Jewish residents live in Upper Nazareth. Jesus spent His youth in Nazareth before beginning His ministry around the age of 30. After moving to Capernaum Jesus returned to Nazareth twice to teach in the synagogue, but was rejected both times (Mark 6, Luke 4). On one visit, people were so outraged at Jesus that they tried to throw Him off a cliff. 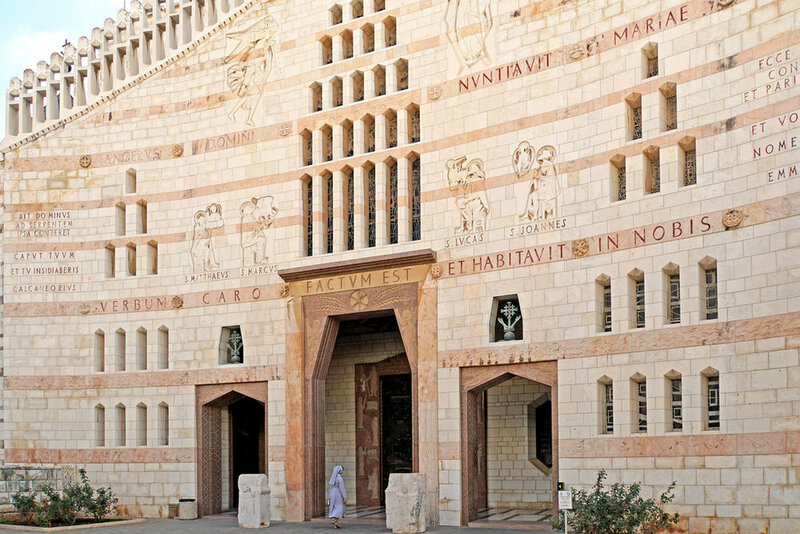 The Basilica of the Annunciation was established at the site believed to be where the angel Gabriel announced to Mary that she would conceive by the Holy Spirit and give birth to a son named Jesus. Mary was engaged to a carpenter named Joseph at that time. (Luke 1:26-38, Matthew 1:18-21). Today, the Basilica is a two-story building constructed in 1969 on top of the site of a Byzantine-era church, and later, a Crusader-era church. The lower level contains the Grotto of the Annunciation, believed to be the remains of Mary’s childhood home. The church is designated as a minor basilica and is considered sacred in some Christian circles. The first shrine dates back to the middle of the 4th century and includes an altar in the cave where Mary is believed to have lived. Emperor Constantine I commissioned the construction of a larger structure. He was directed by his mother, Saint Helena, to establish churches commemorating important events in the life of Jesus. The Church of the Annunciation was established around the same time as the Church of the Nativity (the birthplace of Jesus) and the Church of the Holy Sepulchre (Jesus’ tomb). It is believed that a version of the Church of the Annunciation existed around 570 AD, but it was later destroyed after the Muslim conquest of Palestine in the 7th century. The second church was built over the ruins of the Byzantine church during the Crusades after Tancred, Italo-Norman leader of the First Crusade, took over Nazareth in 1102. The church was never completed. Five Romanesque capitals, carved by French artists around 1187, were discovered during excavations in 1909. The capitals had never been installed because word had reached Nazareth that Saladin, the first Sultan of Egypt, had been victorious in the Battle of Hittin and took control of Palestine. However, Franciscan priests were allowed to remain in Nazareth to oversee the church. In 1260, Baybars, the Fourth Sultan of Egypt, and his Mamluk army destroyed the church in an attack on Nazareth. A small number of Franciscans managed to stay until the fall of Acre in 1291. In the three centuries that followed, the Franciscans were in and out of Nazareth due to the constant political instability of the area. Franciscan accounts document expulsion in 1363, return in 1468, and a massacre of some of their members in 1542. The remaining Franciscans, with support from local Christians, helped care for the church. When the Franciscans returned in 1620, they enclosed the holy grotto venerated as the house of Mary. In 1730, a new church became a gathering place for the Latin community. It was enlarged in 1877, then demolished in 1954 for the construction of a new church designed by Italian architect Giovanni Muzio. The church was built by the Israeli firm Solel Boneh during 1960-69 and dedicated by Pope Paul VI in 1964. It remains under the control of the Franciscans and is the largest Christian sanctuary in the Middle East.